The Cured review: "Packs tension, resonance, and clout"
Over-ambitious perhaps, but Freyne’s intensely executed ‘infected’ fable packs tension, resonance, and clout. Between The Walking Dead’s decline and goofy filler like Pride and Prejudice and Zombies, the pressure’s on to sharpen zombies’ bite. Colm McCarthy’s The Girl With All the Gifts managed it; so did Yeon Sang-ho’s rattling-good Train to Busan. Now, writer/director David Freyne’s feature debut tackles its revivalist task boldly, splicing a zombies-as-allegory premise with the ‘infected’ sub-genre’s untamed instincts and plenty of raw-nerve feeling to toothsome ends. Despite some rough edges in the plot and character departments, Freyne’s blend of kitchen-sink pungency, charged politics, and pummelling shocks harnesses the conviction needed to hold up besides its more obvious precedents. Echoing 28 Days Later via the BBC’s dearly departed In The Flesh, Freyne conjures a set-up in which 75 per cent of those infected by Ireland’s zombifying Maze Virus have been cured, the ‘resistant’ remainder quarantined. 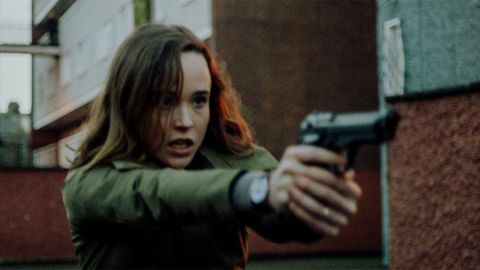 Discharged to live with sister-in-law Abbie (Ellen Page) and her son, recovered zombie Senan (Sam Keeley) faces close monitoring and deep social prejudice. And his wobbly position is not steadied by secrets pertaining to what happened between him and Abbie’s husband. But Senan is not alone. There’s Conor (Tom Vaughan-Lawlor), a barrister-turned-cured-zombie lumbered with custodial work. And a resistance group has formed of ex-zombies dead set on incinerating zombie-phobia, making the threat of internecine conflict seem inevitable. Terror and terrorism, bombs and bite, resentment and reintegration: even if the powder-keg subtexts aren’t subtle, Freyne deploys the tools at his disposal to land them with a wallop. Jens Rosenlund Petersen’s fluent sound mix ranges from suspense-building near-silence (hungry panting aside...) to slamming shocks with an assaultive clout that makes the jump-jolts hit home. Adding emotional ballast to his metaphors and something-around-the-corner scares, Freyne works in the fertile idea that the cured can recall their time as drooling beasties, every guilty (and messy) chow-down included. If these densely layered themes aren’t always fully integrated with the demands of characterisation, the compensations are many. Piers McGrail’s crisp cinematography, some sharp set-design conceits (watch out for the bus posters...) and a mordant gag about McDonald’s combine nicely to create a well-wrought realisation of a traumatised Ireland, whose history lends the unmistakable punch of specifics to Freyne’s take on nations scarred by division. Against this persuasive backdrop, the cast give it their all. Between this and the rootsy assurance of Freyne’s handling, the dead just banked another lunge at redemption.